A high-output, 7-string, neck-position humbucker for balanced and warm instruments that's ideal for heavy metal, speed metal, or any music featuring fast, aggressive, solo playing. To meet the growing fan base of seven-stringed guitar players, Seymour Duncan has released of several of their most popular pick-ups that have been specifically re-designed to capture the deeper tones and wider range of sound found in the new generation of seven-stringed instruments. Shredders and metal-heads will elate in the high output that the Full Shred SH-10 7-string pickup offers. For years, the Seymour Duncan Full Shred has been revered for its top-end clarity and its crisp, well-defined low end. Its aggressive midrange is great for capturing clear, tight tone during heavy rhythms and speed riffs. Two symmetrical coils and short Allen head pole pieces produce a more intense, focused magnetic field while the Alnico 5 magnet maintains an organic attack and feel. The Full Shred is perfect for rock, heavy metal, speed metal, and any music featuring fast, aggressive, solo playing. It comes with a four-conductor hookup cable for various switching options and matches well with Seymour Duncan's SFX-04 Twin Tube Mayhem for ultimate heaviness. A pickup with high-output tone for heavy rhythms and speed riffs. Used for classic rock, heavy rock, hip hop, fusion, and aggressive solo playing. The Full Shred neck pickup has reduced output and more treble for tonal versatility. 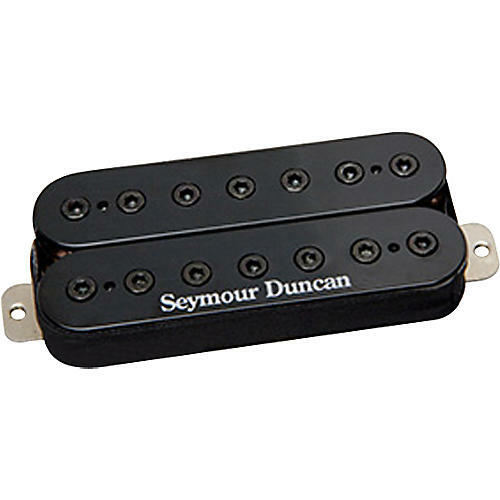 These pickups come with a black cover; are produced at the Seymour Duncan factory in Santa Barbara, California; and made their debut at the January 2010 NAMM show in Los Angeles.